There are only nine southern hairy-nosed wombats in five North American institutions, including at Brookfield Zoo. Now, guests can venture over to the zoo’s Australia House to see the latest addition. A wombat joey (a marsupial baby), born on February 4, 2017, is out and about exploring her surroundings along with her mom, 17-year-old Kambora. It wasn’t until the joey was about 6½ months old that animal care staff first saw her emerge from Kambora’s pouch. 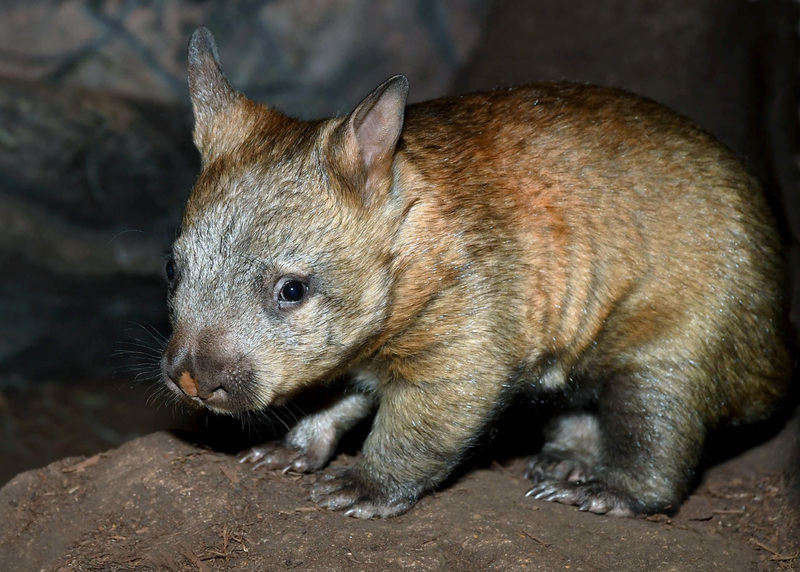 At birth, a wombat joey is tiny and hairless, and is about the size of a bumblebee. It climbs into its mom’s pouch where it attaches to a teat and remains there for the first few months of life. While in the pouch the young joey sleeps and nurses, getting all the necessary nutrients it needs to fully develop. The joey at Brookfield Zoo appeared for the first time at the end of August, at which time she would be visible for short spurts before climbing back into the pouch. Now weighing just over 10 pounds, the joey is very inquisitive and becoming more independent. The not-yet-named joey is Kambora’s sixth offspring and the first for the sire, 5-year-old Darryl, who arrived at Brookfield Zoo in 2016 from Australia. 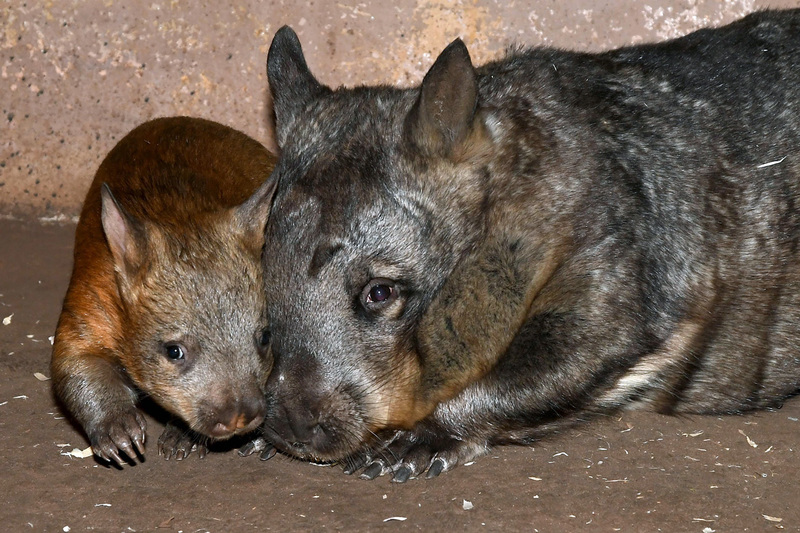 Several years ago, Chicago Zoological Society staff worked closely with the other North American zoos that have southern hairy-nosed wombats, along with Zoos South Australia and their government, to form and develop a breeding program to ensure a genetically sustainable population for the species in professional care. In 1969, Brookfield Zoo received three southern hairy-nosed wombats, and, in 1974, became the first zoo outside of Australia to successfully breed the species in professional care. Since then, there have been 21 wombat births at Brookfield Zoo. Southern hairy-nosed wombats, whose closest living relative is the koala, are thick, heavy-bodied animals. They are native to central southern Australia, where they live in arid to semiarid savannah woodlands, grasslands, and low shrub plains. They are about the size of a medium-size dog, but are much more rounded and solidly built. The pouch opens to the rear, so that when they are digging, soil does not get into it. Wombats have long claws, a stubby tail, a flattened head that looks too big for their body, and short, powerful legs. 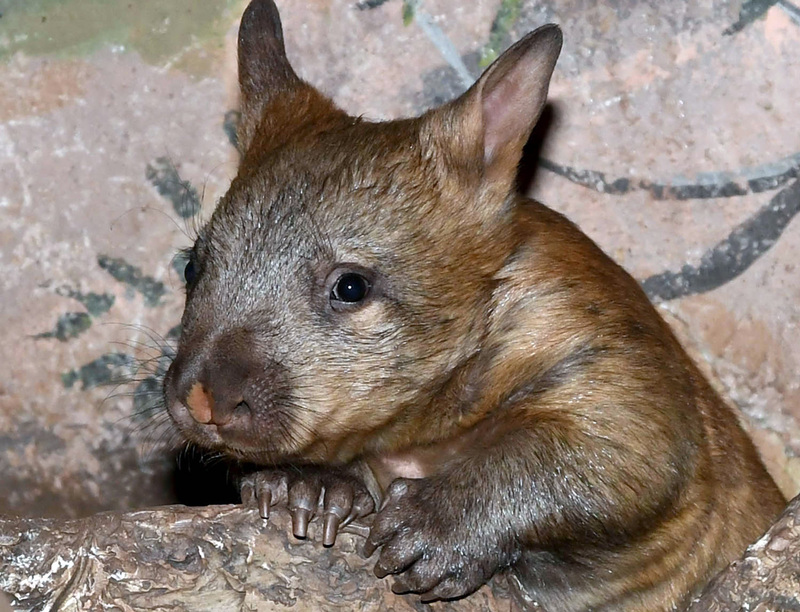 They use their long claws when digging warrens—complex, underground tunnel systems—that are the center of wombat life. Each warren is made up of several separate burrows. Wombats never wander too far from their warrens. Several wombats may have their warrens near each other, forming a cluster. However, they rarely interact with each other. Currently, the wombat population in Australia is being threatened by habitat loss, drought, and agricultural practices.